My sister and I were raised in the NYC suburbs in a middle class neighborhood where our parents and teachers encouraged us to dream at a young age of being authors, poets, the first woman president -- the options for young girls were (and still are!) limitless. We were groomed from the age of five to learn the skills necessary to finish high school, get into good colleges and create sustainable careers that would allow us to be independent and one day support our own families. The path was always clear to me and to my female peers: work hard in school, go to a good college, get a good job. Marry someone if you want, have kids if you want, but first and foremost get settled in your career. On the other side of the world, girls born around the same time, growing up in homes where they likely weren't encouraged to go to school because they'd be married by the age of 15, even 12, so the rationale for getting an education simply wasn't there. Plus, the families need them at home to help their mothers do laundry by hand, carrying the water from the one working well a mile away. On the days when the girls can go to school, they have to get there via a two-hour boat ride each way that rides through mosquito-infested waters. So they often opt to spend their days like their mothers and their mothers before them -- helping in the fields, taking care of the other children in the village, sewing clothes and preparing food for the family. Whereas going to school a few blocks away was our norm, this is their norm. In places like Guatemala, Morocco, Vietnam, Cambodia, India, Kenya and elsewhere, if a young girl aspires to do anything in her life other than what's expected, which includes bearing a child at a young age at the risk of developing a fistula, it is an impossible, exhausting challenge. But the stories of determination that arise out of these impossible challenges are astounding. In Midelt, Morocco, in the Atlas mountains of Morocco, I met a woman named Hayat who had to take over her father's business when he fell ill one day, and she started managing his rug shop. Soon she taught herself how to weave the rugs to be sold. After getting a micro-loan from Nest, she invited other women in her rural village to learn the craft of weaving so they could make extra money to support their families. At age 20, Hayat was running the first women's rug-weaving cooperative in Midelt, bringing extra money into the community, creating jobs for dozens of women and putting food on the table for their families. 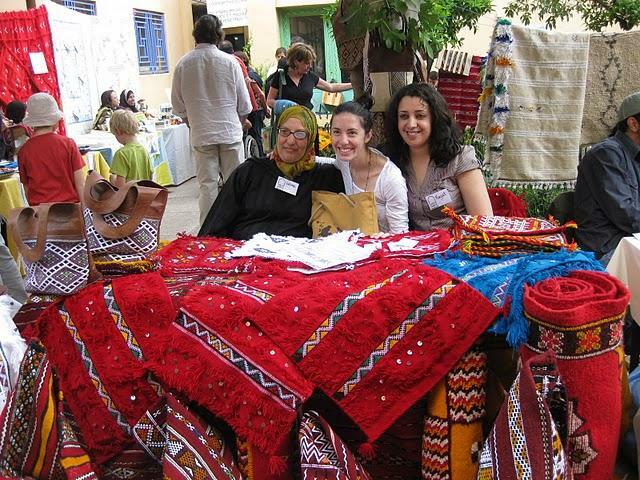 She eventually raised enough money to bring the hand woven rugs to tradeshows in Germany and the U.S., becoming the first person in her community to travel out of the country. Ana Teresa, a 14-year-old in Panachel, Guatemala, stayed home to help her mom cook, take care of her seven siblings, and look after the family's chickens and pigs. She attended school for half a day once in awhile so she could work part time and help support her family. But after relentless determination and a scholarship from She's the First, Ana Teresa will be the first in her family and the only girl in her community to graduate from secondary school. Her parents realize they'll lose income because of it since she won't be bringing in a part-time salary anymore, but they hope the investment in her future will yield greater benefits in the long-term. Thanks to organizations like the Half the Sky Movement, She's the First, Nest and more, women in developing countries are finally starting to dream big. At young ages, they can dream of being entrepreneurs, politicians, business owners, community leaders. And by investing in their education now, we can help make those dreams a reality. This is Ana Teresa, the 14-year-old girl in Guatemala who will be the first in her family to graduate from secondary school.